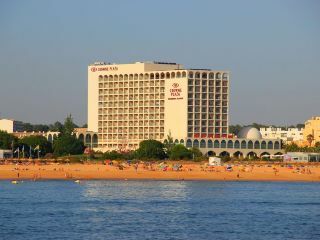 Built in 2009, This Family-Friendly Conference Hotel Comprises a Total of 327 Rooms Including 17 Suites. Facilities On Offer To Guests At This Air-Conditioned Establishment Include a Lobby Area With a 24-Hour Reception and Check-Out Service, Lift Access and a Newspaper Stand. The Younger Guests Can Let Off Steam in the Children'S Playground and the Kids' Club and There is a Bar and a Restaurant. The Hotel Provides Conference Facilities and Wlan Internet Access Throughout the Hotel Grounds (Fees May Apply). Guests Can Also Take Advantage of the Room and Laundry Services (Charges Apply To Both) and Private Parking is Also Available Free of Charge. It is Also Possible To Hire Bicycles On the Premises and Explore the Surrounding Area.